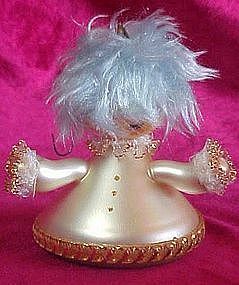 Unusual vintage Christmas ornament made of hand blown glass. Blue fur hair, metallic lace trims. Measures 4" tall. Written on the bottom: to Michelle, from Mommy & daddy 1975.. A swatch of peeled paint missing on the bottom. No cracks or chips. Metal cap missing for hanger. Very unique and collectible.